This photo was taken at 5:30am on October 15, 2012. The location was in a circular drive next to a very large building in Washington DC. The "Take It!" came from having just finished a drive of about 30 minutes with this celestial show as company. The North Star along with a fingernail moon were in a way, sort of a comforting constant. I am lucky to have a job that has me out on the road early in the morning in order to avoid being caught in commuter traffic,; thus I have many opportunities to witness the moon in a variety of stages. I often take photos of the moon and because my camera does not have a huge lens, I have to hope to gather some sort of image. In this instance I was lucky enough that the street light in the foreground had its bulb burned out. I was able to gather in the two celestial bodies in this very grainy photo. The texture of the photo reminds me of some of those pictures we have all seen of what were supposed to be flying saucers or space crafts from outer space. Hope you enjoy this photo for it gives me a chance via the adding of more light to change it from just two dots of white on an almost totally black picture, to this grainy photo that has a lot of images. Another great part of this photo is that it has given me a chance to, in a way, have you join me in the early stages of a day. A true "gift," everyday. Thanks for joining us for the current photo presentation. You are cordially invited to return Friday, December 7th for a new picture that we hope you will enjoy. 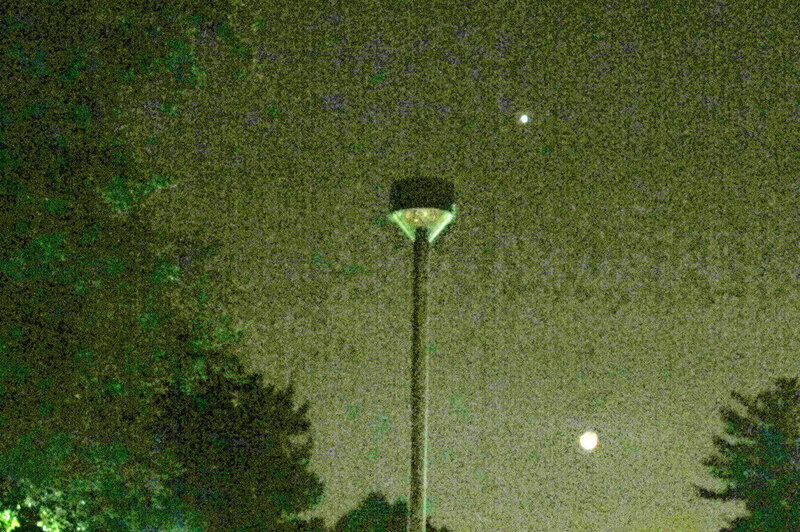 That'd be nuts if one of the lights was in fact a UFO, lol. Straight out of X Files! The grain look it has to it is very cool. You said you did this on a computer? Thanks for the kind comment. The grainy effect was unexpected via a computer at the camera store where I make prints. I am going to have to check that out. I can only imagine the fun I can have with that effect. That is amusing the first thing I thought was x files 2!